One-and-half-year-old Farhiya sat in her mother’s arms at an International Medical Corps facility. She was unable to move, unable to smile, unable to even cry. 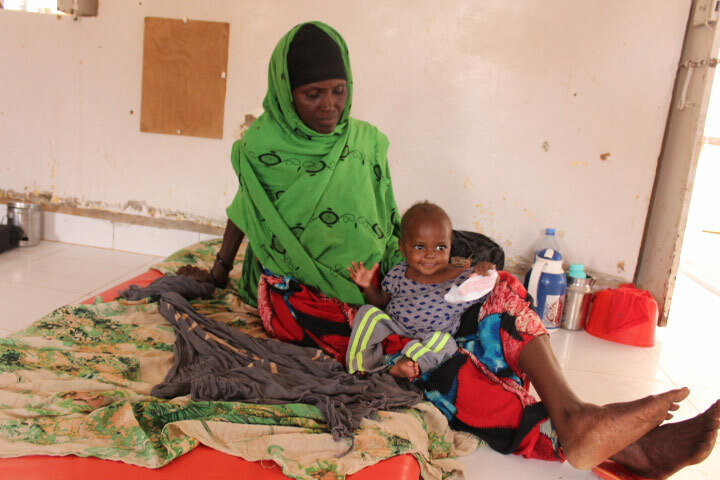 Her mother, Duniyo, travelled more than 10 kilometers to bring Farhiya to International Medical Corps’ Intensive Stabilization Centre in Galkacyo town, Somalia. “I was hopeless, but I decided to give her the chance by seeking treatment,” Duniyo explained. 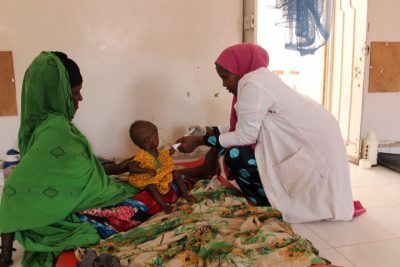 Farhiya is one of 364 children admitted in the last three months to the stabilization center in Galkacyo Hospital who received treatment for severe acute malnutrition. Thousands of children in Mudug region are at-risk of or suffering from severe acute malnutrition as a result of deterioration in food security and economic livelihoods. Their plight is a tragic consequence of the nutrition crisis in the Mudug region, where drought, insecurity, and recurrent disease outbreaks have converged to create a severe humanitarian crisis where millions are on the brink of famine. It was during the daily community screenings conducted by International Medical Corps’ community health workers that Farhiya’s condition came to light. After a brief consultation, they found out that the little girl was suffering from diarrhea, fever, persistent cough, and poor appetite. The community health workers immediately called for an ambulance and facilitated her referral to Galkacyo South Hospital. When she was first admitted to the stabilization center, Farhiya weighed 9.25 pounds – more than two pounds below the average for a healthy child her height. She looked wasted, her skin stretched over her tiny bones. During the first four days, Farhiya received therapeutic milk to restore her metabolic functions. Two weeks later, the little girl was able to start eating therapeutic foods like Plumpy’Nut in addition to the therapeutic milk, to provide her with essential nutrients. The results were promising. At the end of the week, Farhiya had gained 2.2 pounds. In the meantime, the girl’s mother was given careful instructions on how to continue her treatment of therapeutic food at home. Duniyo recalls the relief she felt when her baby daughter was discharged from the stabilization center. Duniyo also appreciates the community mobilisers who initiated the journey to recovery by encouraging her to take Farhiya to the hospital and by facilitating the referral of her daughter. With funding from the EU’s humanitarian budget (ECHO) and the United Nations’ Children’s Fun (UNICEF), International Medical Corps is providing life-saving health and nutrition services at Galkacyo South Hospital, availing accessible and quality care to vulnerable populations in Galkacyo South, Somalia – saving thousands of children in Mudug, who – like Farhiya – are on the verge of succumbing to malnutrition. Duniyo is happy and thanks International Medical Corps for saving her young daughter’s life.